In addition to revenue generated by its Thrift Store, Peppermint Pig Animal Rescue depends upon cash and in-kind contributions from individuals, businesses, corporations, and others, as well as monies raised through events and grants. Donations of stock, property, including real estate, and other substantial contributions are also greatly appreciated and would help provide needed resources for future development projects. Please remember Peppermint Pig when doing estate planning. Our loyal, and generous supporters make it possible to provide the very best in care for our rescues. Your donations are critical for our rescue mission. We need your financial support to continue our mission to save lives. The average cost to completely vet a healthy dog coming into our rescue is roughly between $200-$300; and that doesn’t cover pull fees the shelters charge us, food, treats, bedding, or any of the other miscellaneous items required to maintain a pet in our care. Your donations are greatly appreciated and much needed; no amount is too small! Our 501(c)(3) status with the IRS makes your donations tax deductible. Peppermint Pig is incorporated in the state of Ohio. We are a 501(c)(3) charity. All donations are tax-deductible as allowed by law. AMAZON SMILE: AmazonSmile is a simple and automatic way for you to support your favorite charitable organization every time you shop, at no cost to you. When you shop at smile.amazon.com, you’ll find the exact same low prices, vast selection and convenient shopping experience as Amazon.com, with the added bonus that Amazon will donate a portion of the purchase price to your favorite charitable organization. You can choose from nearly one million organizations to support. 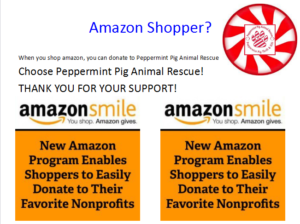 Simply visit smile.amazon.com and enter Peppermint Pig Animal Rescue as your charity of choice. From that point on, your choice will be remembered by Amazon and every time you shop, a donation will be made to Peppermint Pig Animal Rescue! KROGER REWARDS: Kroger has reached out to help local charities with its “Kroger Community Rewards.” We are fortunate to be one of these charities. Peppermint Pig Animal Rescue has been assigned a non-profit organization number by Kroger. That number is 82651. It is easy to sign up and help raise funds to support our rescue, vetting, and adoption of dogs and cats. Register your Kroger Plus Card and Peppermint Pig Animal Rescue will automatically receive a percentage of sales when you swipe your card during check-out at your Kroger store. 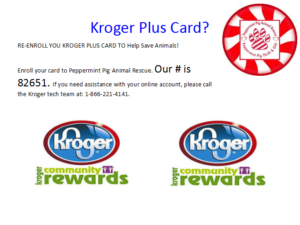 Have your Kroger Plus card handy to register your card with Peppermint Pig Animal Rescue after you sign up. Click on “Community Rewards” and “Edit Kroger Community Rewards” information and input your Kroger Plus card number. Update or confirm your information and save your changes. To verify you are enrolled correctly, you will see your organization’s name on the right side of your information page. You can select “Search” also. Purchases will not count for Peppermint Pig Animal Rescue unless you register your card. Do you use your phone number at the register? Call 800.576.4377, select “option 4” to get your Kroger Plus card number. You must swipe your registered Kroger Plus card or use the phone number that is related to your registered Kroger Plus card when you shop so each purchase will count. Thank you to everyone who supports us through this program!! 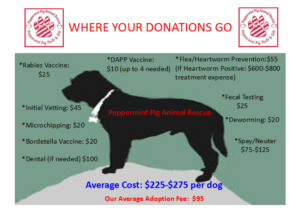 WALK FOR A DOG: When you take your dog for a walk, you can donate to Peppermint Pig Animal Rescue! 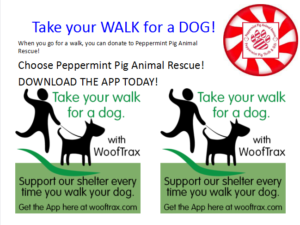 Download the app at Wooftrax.com and select Peppermint Pig Animal Rescue to start donating today! The more people actively walking with the free Walk for a Dog app, the greater the donation to your selected animal organization! Use the app each time you grab for the leash. It’s healthy for you, your dog, and your favorite rescue. Come shop in, or Donate Gently Used Items to Our THRIFT AND GIFT Store! 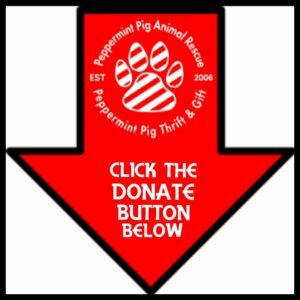 SPONSOR A PET: The cost to provide quality care for the animals at Peppermint Pig Animal Rescue adds up – and the more we can raise, the more animals we can help! 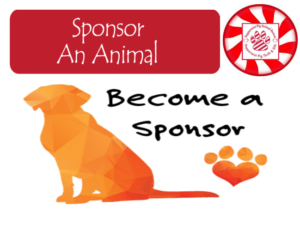 Please consider sponsoring one of our dogs or cats – the rewards are endless! We save lives, help blind pets see again, help injured pets walk again, help stray mothers find homes for her babies, have spay/neutered countless animals. We do whatever it takes to help them, and as long as these fur-babies need us, we will strive to be there for them, but we cannot do it without YOU. We thank you for your support! 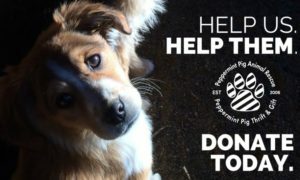 SPAY IT FORWARD: With our Spay it Forward campaign, it’s easy to make a secure donation through PayPal or simply round up to the next dollar amount on your next purchase at Peppermint Pig Thrift and Gift to help us spay and neuter dogs and cats to prevent more pet overpopulation. By sponsoring one, or any, of our adoptable pets, you are helping to provide them with essential vet care they need, as well as food and supplies while they stay in their foster homes. Thank you for your support! Another great way to help is to purchase items from our WISH LIST to donate! DONATE COLLARS AND LEASHES: These stylish collars and leashes are great for striking up a conversation about your rescue dog’s story, AND you get to help another rescue dog with your purchase! Just enter Peppermint Pig Animal Rescue in the space available at check out and Project Blue Collar will match your purchase and send us a FREE collar or leash for one of our rescue dogs! Get A Blue Collar today!